Greetings and welcome to Prairie Dirt Writings. On this blog you will find some of my favorite writings over my 13 years of involvement with the dirt track racing community. Writing is like taking a photograph. It is capturing a moment in time. These articles, columns, reports and releases are unedited. I hope you enjoy reading this collection as much as I enjoyed writing them. WINNIPEG, MB (September 17, 2013) A friend once told me to enjoy my ride, because one day it would end. At that time in my life, I had started writing my periodic motorsports column "Dirt from the Stands" for Don MacAuley's SprintsandMidgets website. Little did I know that this one lone opportunity would springboard me into a fast-paced 13 year journey in dirt track racing that almost seemed to pass as fast as the high-flying action I was covering on race day. In my racing life, I have been blessed with the opportunity to meet and work with many wonderful people. Most are still with us but sadly some have passed. Racers, fans, media, volunteers, photographers and promoters have all played a part in this journey. As in life, I have seen the best in people and also the worst in people. All I will say about the negative is many good people with great ideas to benefit the racing community have been prevented from doing so because of politics, selfishness and greed by those who wish to keep the status quo. In the world of racing, you learn who your friends are and who are not. With some it takes a little longer to discover than others. Politics is the bane of racing. We lose good people because of it. Pure and simple. I love the province of Saskatchewan for many reasons. If I had to use one word to explain, it would be COMMUNITY. 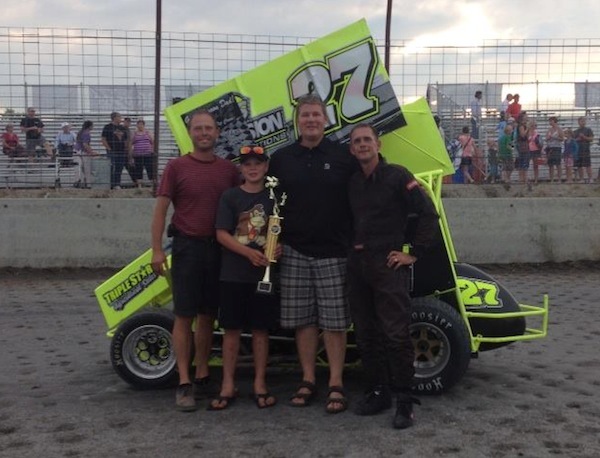 In the Fall of 2003, an email enquiry from then board member and mini-sprint racer Darcy Walker blossomed into a long-standing friendship with the folks at Southeast Saskatchewan's Estevan Motor Speedway. The atmosphere on race night is more reminiscent of a family reunion with the setting at a dirt track. Of all the places travelled, I have never felt so welcomed by a community than by the people of Estevan. The first time I walked up to the pit gate to sign in, I was greeted with a friendly smile and "Hi Greg!" Darcy Walker, former track president's Reg Stephen, Pat Boyle and David Mack are only a few of the people who always made me feel at home. I was always treated well and that's the best feeling in the world. My promotional work for Estevan's sprint car races sparked a new friendship with the racers of Edmonton's Alberta Sprint Tour. This 360 sprint car group had expressed an interest in travelling eastward to Estevan and possibly to Winnipeg as early as 2006. Although this proposal fell on deaf ears in Winnipeg for a number of years, I never stopped promoting the idea. It was something I believed in and if given the opportunity I KNEW it would work. My support of the Alberta Sprint Tour was honored with a 360 sprint car weekend at Speedy Creek Raceway in Swift Current, called the Prairie Dirt Classic, which ran from 2007 to 2009. 2009 was by far my favorite year. 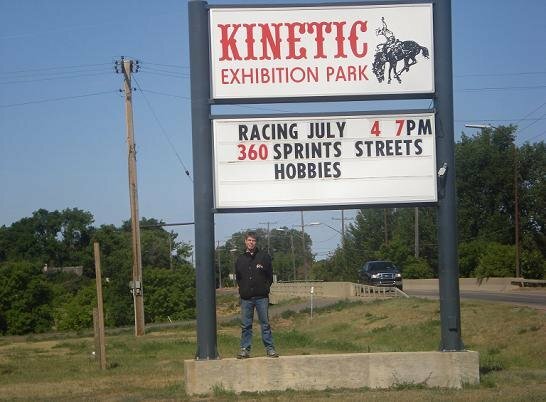 The dream of an extended western prairie sprint car tour was finally realized in 2009 with shows in Winnipeg and Swift Current. The misconception of Winnipeg only supporting a 410 sprint car show was debunked with 16 360's in the pits on race night. The finale is still talked about today. Travelling with the Alberta teams to Swift Current was a great experience. This was the first father-son trip Aaron and I had taken outside of Manitoba. Top that off with sprint car racing on a fun bullring in Kenetic Park and you had the makings of a memorable racing trip. Besides the great racing was the friendly racing community of Speedy Creek Raceway who made me feel most welcome during my visit. 2009 was also the year that president Darren Pallen invited me to write for the Northern Lightning Sprint Association. We started on Saturday nights with the Enduros before moving to the mainstream Thursday night program in 2010. The lineup has changed quite a bit from the teams in the inaugural season. I have had the pleasure of meeting some really nice people through the NLSA. For an open wheel advocate like me, a weekly class like the Lightning Sprints was a welcomed change from one sprint car show per season. Past NLSA president Darren Pallen and current NLSA president Chris Unrau have always been supportive and respectful towards my family and I. At the end of the day, that means a lot. For all the years I was involved with Victory Lane / Red River Co-op Speedway, I never quite felt at home there until the Lightning Sprints arrived in 2009. If there is one Manitoba dirt track that has that "COMMUNITY' feel that I enjoy, it is Morden's ALH Motor Speedway. Southern Manitoba's short track is my kind of place with it's friendly, laid back atmosphere and fun racing. This year I finally accepted a long-standing invitation by my good friend Anthony Leek to visit Emo Speedway. There was a greater sense of urgency about going as Anthony's priorities have changed over the past few years. The Northern Late Model Racing Association was at Emo and after seeing that show, I was kicking myself for not going sooner. Emo Speedway is a flat out fun bullring to watch racing on. If I was to ever own a race track and needed a management team, I already have a short list of candidates. The list is based on my personal experiences with people and observations over the years. My top 2 candidates would be Anthony Leek and Derek Pollock. When it comes to race promotion, Anthony has a positive energy and drive that very few would be able to keep up with. His good vibe is infectious and I would welcome that any day. I have admired Derek Pollock's entrepreneur's spirit since I first met him. From selling stickers to custom diecast cars to renting race cars, Derek has a knack for creating fun and entertaining products that people will buy into. He was hired as the manager of Red River Co-op Speedway in 2008. Sadly, Pollock only lasted one season. If I was to ever want a promoter who would create a fun, family-friendly atmosphere for fans to come, and enjoy themselves on race night, Derek Pollock would be my guy. Involved and engaged fans make for happy return customers. I am confident that both Derek Pollock and Anthony Leek would bring that to the table. Self-proclaimed promoters who simply open a gate and sell tickets are not what they claim to be. Apathy in any business is a killer. You not only lose good people within your organization, you lose customers. My decision to retire from motorsports writing is a simple one. I wish to spend more time with my family and pursue other interests that I have put on hold for many years. There are, however, some parts of my racing life that I will continue with. Before I turn out the lights, I want to thank each and every one of you who has been a part of my racing journey for the past 13 years. You all hold a special place with me that I will treasure for as long as I live. This is your Prairie Dirt reporter Greg Cybulski saying, Take care and God Bless. Greg Cybulski, MORDEN, MB (August 11, 2013) Frank Elias drove the race of his life and netted a cool $1,000.00 first prize money as he became the first winner of the Northern Lightning Sprint Association's Northern Shootout at Morden, Manitoba's ALH Motor Speedway on Sunday evening. He started by having the fastest lap in qualifying, followed by a dominating performance in his heat race. Elias then proceeded to win the Pole Dash, earning himself the pole position for the feature. This was truly Frank Elais' finest hour as a racer. Elias dominated and drove the Chris Unrau #27 Lightning Sprint into victory lane but under difficult circumstances. Earlier in the week, the Unrau family was torn by the loss of 2 family members. In their memory, a sign was displayed on the #27's wing which read, "You have fought the good fight, you have finished the race. Forever in our hearts, Barry and Zack." In 2006, Carrie Underwood recorded a song entitled Jesus, Take The Wheel. On this night when everything ran to perfection for Frank Elias and team Unrau, one gets the feeling that He may very well have done just that. Sometimes all you need is a positive sign to make a bad day better. For the Unrau's, witnessing this Devine drive of their car came at just the right time. For NLSA president Chris Unrau and the members of the Northern Lightning Sprint Association, this day was a sign of hope for a better tomorrow. Rounding up the top 5 were Frank Elias, Roland Bernard, Brent Steg, Murray Temple and Al Giesbrecht. The next scheduled racing action for the NLSA will be Monday, August 12 at Red River Co-op Speedway. Start time is 7:30pm. MORDEN, MB (July 27, 2013) The Northern Lightning Sprint Association is pleased to announce their very first $1,000-to-win event. 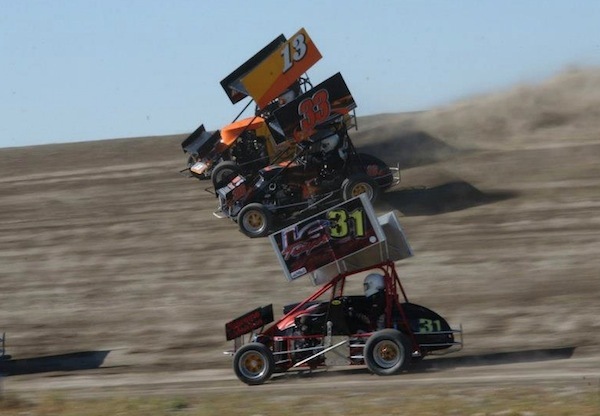 The Northern Shootout will be hosted by Morden, Manitoba's ALH Motor Speedway on Sunday, August 11 and promises to be the open wheel show of 2013. 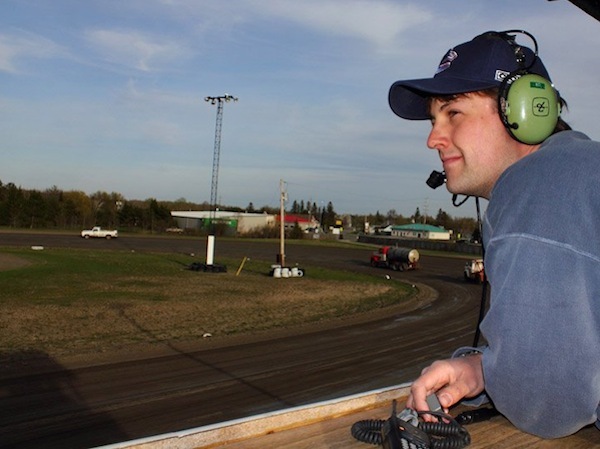 Following on the heels of Greenbush Race Park's popular Chad Olson Memorial, the Northern Shootout has the potential of being Southern Manitoba's most successful dirt track racing event this season. The 2013 Chad Olson Memorial drew an impressive 19 Lightning Sprint teams. Think this is going to be just another race? Better think again. August 11th will feature a $2,500.00 purse with $1000.00 going to the winner. All competitors will go through time trials. There will also be a pole dash. Morden's popular oval dirt track is the perfect setting for such an event. Wide open spaces with plenty of room for everyone. The staff at ALH Motor Speedway always welcomes it's racers and reflects the friendly in 'Friendly Manitoba'. Sunday evening racing should help draw teams who will be racing just across the line at Devil's Lake Speedway on Saturday, August 10th. A post-race pit party, live entertainment and pork barbecue are all being planned as part of this great evening of racing. Lightning Sprint time trials begin at 3:30 PM. Racing starts at 4:00 PM. The Inaugural NLSA Northern Shootout is presented by Triple E Developments, Wolfe Enterprises and Elite Crushing. (July 23, 2013) Since its inception five years ago, the Northern Lightning Sprint Association has been fortunate to enjoy arguably more press coverage and race reporting than any other class at Red River Co-op Speedway. But this wasn’t your average, run-of-the-mill race reporting. In fact, you could clearly see the dedication, passion, and extra effort between the lines of every article he wrote. And now, as they say, all good things must come to an end, as Greg Cybulski has decided to step away as NLSA Director of Media Relations to pursue other avenues. "After five years as Director of Media Relations for the Northern Lighting Sprint Association, I've decided to step away from that title and carry on with more personal matters." "My family life and new career seem to be getting more busy all the time." "I am thankful for my time as NLSA Director. I want to especially thank former NLSA president Darren Pallen and current president Chris Unrau for the opportunity of working with this great organization." "I've had the opportunity to meet and work with some wonderful people over the past 5 years." The Prairie Dirt reporter will continue to post comments and racing news on his blog, Dirt from the Stands, however his direct involvement on race nights will be slowing down. The Northern Lightning Sprint Association wishes Greg all the best in his future endeavors. Greg Cybulski, WINNIPEG, MB (May 20, 2013) Anthony Leek is one of the closest friends I have had in our racing community since I first got involved 13 years ago. For the decade or so that I have known him, he has never changed. He is bright, energetic and has a common sense approach to the business of dirt track racing like no other person I know. In a sense, I understood him because he always tried to do what was right for his local racing community. The Emo, Ontario resident worked hard to promote his home track of Emo Speedway. He volunteered to work at the track. As well, Anthony got involved with the direction of his home track by becoming a board member. Eventually he was elected as President of Emo Speedway and had a successful run until his decision to step down. 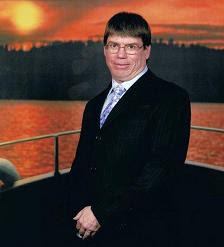 Where Anthony Leek shined the greatest was his promotional work, especially his project, the Northern Super Stock Touring Series in 2007 and 2008. Anthony was driven to succeed. From organizing sponsorship to getting tracks to host his tour, nobody did it nor will ever do it like him. Whenever he was in town, I would always get a call to arrange a meeting at our usual hangout, the Dairy Queen at Pembina Highway and Bison Drive. What would typically start out as a conversation over ice cream would sometimes be an overrun chat session about racing where time was forgotten. What many people don't know is if it wasn't for Anthony Leek, I may have left racing for good in 2007. His friendship, encouragement and support brought me back to Red River Co-op Speedway in 2008. To this day I still consider 2009 as my most satisfying and fulfilling season to date. A season that I almost missed. Lately our conversations have been less about racing and more about our future goals and dreams. Anthony Leek is turning a page and moving on to a new chapter in his life. His desire to get involved in provincial politics and hopefully represent the people of Kenora-Rainy River in the upcoming Ontario election comes as no surprise. He brings that same common sense and infectious enthusiasm to a new group of people that he always has for his racing community. Anthony Leek is all about community and representing the best interests of the residents within his community. For this, he is perfectly suited for a life of public service. Earlier this year, I got an email from Anthony that simply said, "One more." He wanted to promote one more race at Emo Speedway before he moves on. On Sunday, June 30th Emo Speedway will host the Northern Late Model Racing Association and this race will have Anthony's signature written all over it. This will be one night that I would not miss for the world. Kaz Grafix photo 3-Wide Lightning Sprints at ALH Motor Speedway. Greg Cybulski, WINNIPEG, MB (May 10, 2013) With Manitoba's dirt track racing season fast approaching, the members of the Northern Lightning Sprint Association are preparing to do battle for bragging rights to the 2013 NLSA Championship. Celebrating it's 5th season, the NLSA promises to be the showstopper that racing fans have come to expect from the high-flying open wheel class. Manitoba's fastest cars on dirt will be showcased every Monday night starting on May 27th at Winnipeg's Red River Co-op Speedway and 7 Sunday afternoons at Morden's ALH Motor Speedway including 2 dates during the Corn and Apple Festival. Morden's first date for the Lightning Sprints is June 2nd. Returning to action will be 3-time NLSA Champion Roland Bernard in his familiar #2 sprinter. He will also have plenty of company vying for the checkered flag this season. In 2012 many teams found their way to victory lane and will be hunting for more including Chris Sorin, Dylan Sabatini, Chris Unrau, Frank Elias, Wally Butler and Amber Balcaen. Speaking of Amber Balcaen, she will be driving for WB Racing this season. In 2012, Balcaen chalked up multiple wins plus she got a taste of success, earning her first Track Championship at ALH Motor Speedway. Raising her game to the next level and racing one of Wally Butler's cars will make Amber a greater threat each and every race night. Fans who remember Butler's blistering performances from last season will know why this could be a huge deal for Balcaen. In the coming weeks, many questions will start to be answered. Who will take the first checkered flag of the season? Who will be victorious and win the 2 Manitoba Track Championships up for grabs? Who will become the 2013 Northern Lightning Sprint Association Champion? On any given night, any team is capable of winning. This is why the Northern Lightning Sprint Association is arguably the most competitive and evenly matched field of cars to race on a Manitoba dirt oval track. Dirt slinging action that will leave you on the edge of your seat. 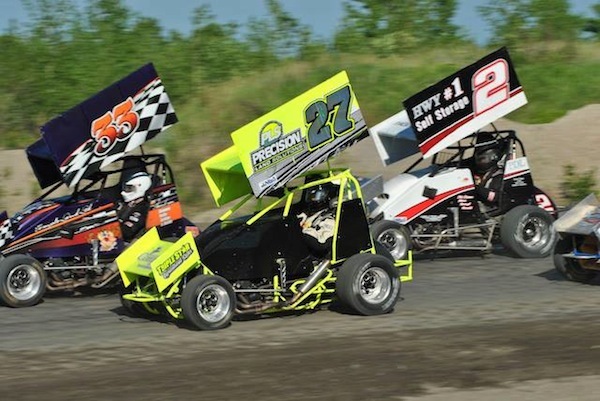 The green flag drops on May 27th for the NLSA and open wheel racing in Manitoba is about to heat up Monday nights this summer to new record highs. The snow is starting to melt in Manitoba and with it come thoughts of the upcoming dirt track racing season. With speedway and tour schedules starting to be released, here are a few notable dates to mark down on your calendars. Reliable sources from Winnipeg's Red River Co-op Speedway have suggested that there will be another Sprint Car show in 2013, however, it will not be the All Star Circuit of Champions this time. Stay tuned for more details in the not too distant future. According to the ASCoC website, their annual "Thunder Through the Plains" tour will include stops at Huset's Speedway on July 21 and August 8. The most notable weekend swing is in Minnesota on Saturday, July 27 at Jackson Speedway and Sunday, July 28 at Glyndon's Buffalo River Race Park. If the Glyndon, Minnesota bullring used to rock with the Wissota 360 Sprints, one can only imagine what race night will be like when the 410 Outlaw Sprint Cars sling dirt out there this summer. The Upper Midwest Sprint Car Series will be making a few stops within driving distance of Winnipeg in 2013. According to the UMSS website, the Sprint Car group will be invading Viking Speedway in Alexandria, Minnesota on Saturday, August 24 and then following that up with 2 nights of racing in Brainerd, Minnesota's North Central Speedway for the annual Mighty Axe Nationals on Labor Day weekend on August 31 and September 1. The World of Outlaws Sprint Cars only Western Canadian weekend, the annual Oil City Cup will once again be held at Edmonton, Alberta's Castrol Raceway on Friday, August 23 and Saturday, August 24. Finally, if you are a fan of the ASCS 360 Sprint Cars, the ASCS Lucas Oil National Series will once again roll into I-90 Speedway in Hartford, South Dakota on Saturday, July 6. The Sioux Falls area is the closest the tour gets to us and would be well worth the trip. Double up your open wheel fun with a Sunday night at Huset's Speedway and you have the makings of a memorable racing weekend. Please be sure to watch for more previews coming up very soon.